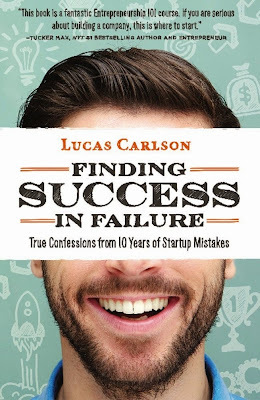 I have the opportunity to read many business books, but the most recent, Finding Success in Failure:True Confessions from Ten Years of Startup Mistakes by Lucas Carlson, is one of the most valuable that I have read. Carlson begins the book by quoting Erik Falkenstein: “Beginners should focus on avoiding mistakes, experts on making great moves.” In this book, Carlson focuses on the beginners and advises people what not to do so they can avoid making the same mistakes he’s made. · Why do I want to start this company? · Who’s my target customer? · What’s their hair-on-fire problem? · Is there an even bigger problem? · What kind of startup do I want it to be? · Does this company align with my core values? · What do I specially bring to the table? The rest of this chapter delves into further depth for each question. For instance, when you think, “Why do I want to start this company?” you must look at not only why you want to do it, but why your customer would want your product. If your desire is not in line with your potential customers’, your business will not likely be successful. 1. Your startup is a reflection of you. 3. You are not your thoughts. 4. Your product is not your company. 5. You don’t have to figure it all out up front. 6. Startups are all about relationships, people, and stories. 7. Get ready for the long haul. As much as you may pour yourself into your business, you are NOT your thoughts (especially the negative ones) and you don’t have to have everything set in stone in the beginning. One of the hardest parts of creating a business from scratch is that you will likely need to put in a lot of time before you see any financial gain. You will suffer setbacks and failures. To survive this difficult time, you must prepare your mind. 3. Learn the difference between big problems and urgent problems. 4. Deal with the most urgent problem first. 5. Place a high value on your time. 7. Surround yourself with advisors. In this chapter, Carlson guides you through questions you should ask when founding a company such as, “Who is responsible for what?” and “What’s your equity split?” Iron out these details before you start your company or in the early stages to avoid difficulty later. Carlson also encourages founders to include their spouses. The spouses need to know how the business is progressing as well as how much money and time is required, etc. to feel more comfortable with the process. If you’re contemplating starting a business, or you’re in the early stages of forming one, you’ll likely find this book very valuable. At only $3.99 for the Kindleversion or $11.99 for the paperback, this book is an excellent buy. (You can also read it for FREE with Kindle Unlimited.) Just the chapter on the logistics of building a startup will save you a great deal of time and money. Throughout this book, Carlson acts as a mentor who is advising and guiding you along the way, which is something every entrepreneur needs.